When you have a serious cough, you might start to worry about what the underlying cause might be. That becomes even more troublesome when your cough seems to never go away. A chronic cough is defined as one that lasts for at least eight weeks in adults and four weeks in kids. Strangely enough, up to 40% of those in the United States have reported a chronic cough at some point in time (and those are just the non-smokers!). It's such a common reason to go see the doctor. But sometimes a chronic cough might mean something much less sinister than your fears. Do allergies make you cough? You might be surprised by what can tickle your throat and make you cough on a regular basis. Yes, allergies can actually make you cough. That's because of the nature of the allergic reaction to pollen, dust and the like. 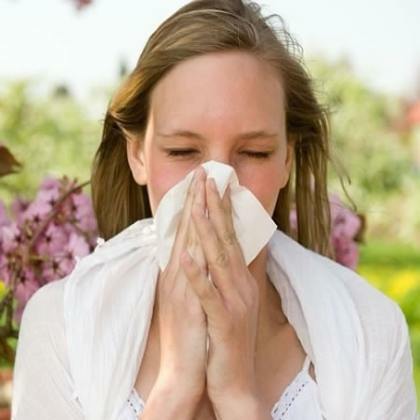 The allergen triggers your immune system to go into overdrive; the result is inflammation of the nose and sinuses. Sometimes this leads to post-nasal drip, which can make you cough all the time. Another problem is that some allergies lead to irritation in the lungs. This is called allergic asthma. It results from allergens causing your air passageways to thicken and produce mucus, which can make you want to cough to clear it all out. So yes, allergies do make you cough! A common cough can result from any of these issues. But how can you know what causes the problem? Upper airway cough syndrome is the name for a chronic cough that might be caused by allergies, asthma or gastrointestinal reflux. So, it is very important to speak to your doctor if you have a chronic cough, and if you have the other signs of allergies. With a runny nose or watery eyes, you might be suffering from coughs that are allergy-induced. How to Tell If the Cough Is Due to Cold or Allergies? Do allergies make you cough? Or is it just the common cold? There are several ways to tell. A cold typically lasts for a few days or even a few weeks and then it's over; an allergy will last all season, or for as long as you are in contact with the allergens. Colds typically happen during the winter, while allergies tend to happen anytime. Colds also take some time to get worse, while allergies get bad almost immediately. Colds and allergies often come along with other distinct symptoms as well. For instance, a cold will often be accompanied by a sore throat or runny nose, and sometimes you will also experience aches and fatigue. With allergies, you often have a stuffy nose and itchy, watery eyes. You might also have a sore throat, but will never have aches or a fever with an allergy which usually come along with a cold. With knowing the answer to the question, do allergies make you cough, you will naturally come to the next concern, how can you relieve the coughs? Read on to find the most effective option for you. When you are suffering from intense coughing caused by allergies, there are some treatments that might do very well in relieving the problem. Antihistamines suppress the immune system reaction, while decongestants help clear out the sinuses and make it easier to breathe. Saline nasal sprays can help break up congestion and also wash any allergens out of the nasal passages. Other options include corticosteroids, montelukast to relive asthma symptoms, and allergy shots that can help eventually desensitize you to the allergens. Alternative treatments like taking a hot bath, inhaling steam, or making your own strong nasal solutions can help. When your cough is caused by a cold, effective treatments include gargling with warm salt water, sucking on ice chips, or turning to cough drops to ease the cough. You can also try over the counter medications that are designed to fight bad colds and the symptoms, as well as supportive therapies, such as extra sleep, doses of vitamin C, drinking extra fluids and the like. Coughs caused by hay fever don't spread between people yet cause a lot of irritation to the throat. You can get various OTC decongestants to cure the postnasal drip and alleviate the itchy and scratchy feeling of throat. Also, antihistamine can also be used to cure this condition. Besides, warm compress is also a good relief option. Soak a clean cloth in a solution of 1 cup of water and 1/8 teaspoon of salt, and then put it to the nostril to inhale the saline solution. Repeat 3 time a day. Of course, some treatments work well for both the above situations. This is a good idea if you are not sure: do allergies make you cough, or is it just a cold? Many home remedies can apply to all the above conditions. As for medication, antihistamines can both work to alleviate symptoms like runny nose, and suppress allergic reactions due to its ingredients of loratadine (Claritin, Alavert), cetirizine (Zyrtec), diphenhydramine (Benadryl), and fexofenadine (Allegra). There are some crossover home remedies, such as using a saline solution to wash out the nose, gargling with warm salt water, turning to a Neti Pot to help ease things along, and using over the counter medications that promise to treat all the symptoms you have, such as a drug that is tailored for allergies with coughs.